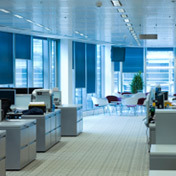 Manchester Air Conditioning (AC) for offices. With greater densities of staffing and the increased use of technology, your office will get too hot, your staff will complain, lose concentration and sometimes stop work altogether. With constantly increasing costs, it is more important than ever to maintain or increase levels of efficiency and production. Installing ACS air conditioning guarantees to create a comfortable, stress reducing, temperature controlled environment that will have a positive impact on your bottom line.